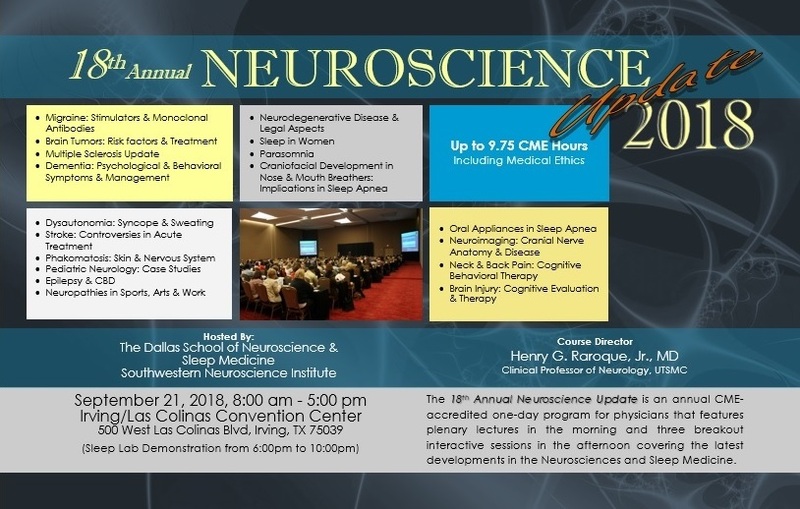 The Dallas School of Neuroscience and Sleep Medicine announces the holding of the 18th Annual Neuroscience Update Symposium at the Irving Convention Center at Las Colinas in Irving Texas on September 21st, 2018. 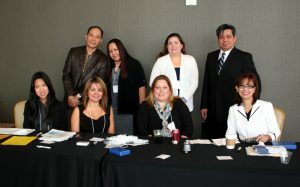 The Dallas School annually sponsors this day of education for neurologists, primary care physicians, PA’s, nurses and technicians to keep them updated on Neurological advances. Now on its 18th year, the Neuroscience Update aims to update the busy Primary Care Provider on new developments in the diagnosis and treatment of neurological and sleep disorders such as Neck and Back Pain, Seizures, Headaches, Optic Neuritis, Stroke, Movement Disorders, Epilepsy and Obstructive Sleep Apnea. The program seeks to ultimately help improve the quality of care for neurology and sleep patients through well-informed health care professionals. The Dallas School hosts this educational activity free of charge. This activity has been reviewed and is acceptable for up to 9.75 Prescribed Credits by the American Academy of Family Physicians (AAFP).